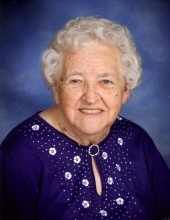 (nee Ziehl) Of Grafton, passed away peacefully, surrounded by her loving family, on Monday, April 8, 2019, on her 95th birthday. Lorraine was born on April 8, 1924, in the town of Fredonia, Wisconsin, the beloved daughter of Charles and Alma (nee Hilgendorf) Ziehl. On February 10, 1945, she was united in marriage to Elroy C. Klug and together they raised five children; Geraldine (Edgar) Juedes, Marilyn Klug, Patricia (Robert) Thompson, Carl (Linda) Klug and Nancy (Michael) Apel. Lorraine is survived by her children; her grandchildren: Jacqueline Juedes, Jeanette (Michael) Gabrys, Michelle Klug, Cory (Del Bricko) Thompson, Kelly (Jeffery) Davis, Kevin (Niki) Thompson, Curt (Amber) Thompson, Kristie (Lucas) Spettel, Dean (Brittany) Klug, Connie (Ben) Buckenberger and Kimberly Apel; her great-grandchildren: Andrew and Trent Davis, Mason, Benett, Everet and Ian Thompson, Natalie and Nolan Spettel, Elli, Clay and Liam Buckenberger, Eve and Ruth Klug, Elijah and Anneke Gabrys, and her sister Violet (Howard) Burks. She is further survived by other relatives and friends. Lorraine was preceded in death by her parents, her husband and three sisters. Funeral Services will be held on Wednesday, April 17th at 12:00 Noon at Immanuel Lutheran Church, W61 N498 Washington Avenue in Cedarburg, WI 53012. The family will receive friends at the church from 10AM until the time of Service. Burial will follow at Immanuel Cemetery in Cedarburg. In lieu of flowers, memorials in Lorraine’s name may be directed to her church. To send flowers or a remembrance gift to the family of Lorraine Olga Klug, please visit our Tribute Store. "Email Address" would like to share the life celebration of Lorraine Olga Klug. Click on the "link" to go to share a favorite memory or leave a condolence message for the family.